run. Note the bandage and ripped shirt. I have been told that my “bucket list” is much more adventurous and dangerous than most. While this may be true, it does not cause me much concern, as I have been involved in a fair degree of danger throughout most of my entire working life. You could say it's all I know. I can not say exactly when I was first bitten by the bull-running bug, but Ernest Hemmingway was most definitely responsible. I found something dangerously romantic with the idea of heading off to a village in Northern Spain and running along narrow cobble-stoned streets as a hoard of snorting bulls pounded mercilessly behind, hell-bent on charging forward at all costs – refusing to be inconvenienced by those who would stand in their way. That is the point at which I have lost many inquisitive souls, trying to fathom why one would voluntarily elect to put themselves in the way of stampeding bulls. “That is very dangerous, you know," some would advise me, in a manner akin to telling a young child that placing their hand on a boiling kettle was not a good idea. “Yes, I know," I would politely inform them, “but that is the best part – the challenge is to survive the ordeal and be one with the beast." Thinking that I did not fully grasp the danger (despite the fact that I had been planning on doing this for at least 25 years), they would add; “People actually get gored to death running in front of the bulls." "Some do," I agreed, “but it wouldn’t be half as much fun unless there was the risk of getting run through by their horns or trampled to death." That was always the exact spot where I lost them. I could see it in their eyes. 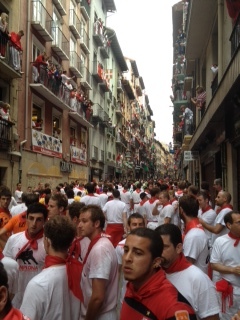 Undeterred by those who did not comprehend the challenge of it all, I set off for Spain in early July, a couple days after the opening of the San Fermin festivities in Pamplona. The train took me from Madrid to Pamplona and the first thing which I noticed after arriving at the train station was that just about every male was dressed in white attire and had a red bandanna around their neck. Every single taxi driver was dressed this way. I saw pensioners dressed in this manner and even toddlers. Going out to dinner that first evening, I wore what I considered to be “regular” street clothes – the kind which would normally allow one to blend in around Europe. As it turned out, I was just about the only one out of thousands on the streets not totally decked out in white. The morning of my first run I got up at 4:30 a.m. and caught a taxi to what would be the heart of the action. Pamplona is a fortress city, built on a height and surrounded by huge stone walls. The driver took me to the bottom of the city and pointed out a penned area where the bulls were kept and from where they would be released on to the streets in about three hours time. I got out and walked the route which the runners would face later in the morning. As I walked up the steep hill towards the center of the city, I began to realize that I was probably the only sober person in the whole city at that hour of the morning. The streets were thronged with revelers. Judging by the state of their once-white clothes, many of which were now doused in red wine, they had continued to party on long after the previous morning’s run (which had concluded some twenty hours earlier). The term falling down drunk may very well have been coined by someone attending this yearly festival in the past. After finding strong coffee, I continued to survey the route along which the bulls would stampede, much in the same way as an investigator would conduct a surveillance dry run in order to find the best vantage point from which to begin. I noticed that about 75% of the run was uphill. This did not bring me a lot of joy, since I did not get in as much training as I had hoped in the months leading up to the event. The more I studied the run path though, the more I realized that being in a downhill position was probably even more dangerous. The streets of Pamplona are cobble-stoned. From about 5 a.m. onwards, street cleaning machines appear out of nowhere and pulverize the streets with high powered hoses and sweepers. Mind you, this does not stop the party in the street – it continues to forge ahead, with late night/early morning revelers jumping out of the way of the high-power water hoses. After experiencing the gusto with which the city workers attacked the streets, it dawned on me that wet cobble stones make for an additional challenge when trying to steer clear of charging bulls. Over the next two hours, more and more men (there were some women, but the ratio of male to female runners was about 95:5) appeared in the streets. By 6am, city workers with large planks of wood started to appear. In a matter of minutes they were erecting strong wooden fences in the middle of the city to separate the runners from the general public. Seeing this frenzied partitioning was the first time that it dawned on me that it would soon be just us and the bulls. As the fences began going up, Spanish Police Officers started showing up in force. They occupied a buffer area behind the fence and I later realized that they observed the runners from that position and when they saw someone who was obviously inebriated, they pulled them out of the line-up. 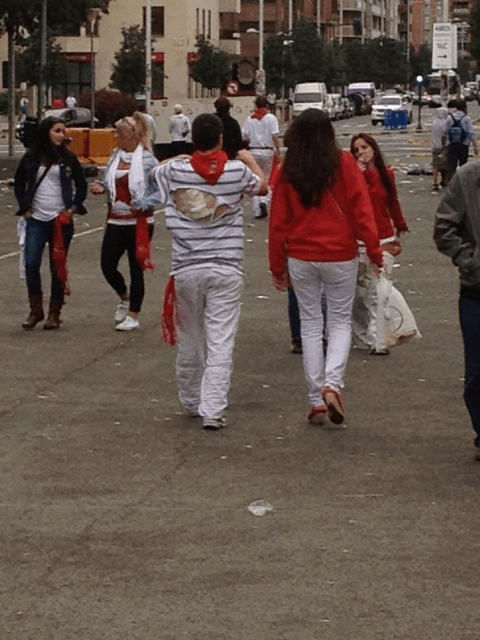 By 7 a.m. the city centre and the surrounding side streets were packed full of bodies in white and red. Around this time, the police formed a human chain at one end of the street. They did this when they decided that no additional runners would be allowed to join the running. For a little less than an hour, we stood shoulder to shoulder with each other, waiting for the first canon blast which signaled that the event was underway. Every now and again, someone would start a pre-run chant and others would join in until we were all chanting intensely and clapping hands. The next sound was the one that struck fear into all of our hearts – a double blast that meant the bulls had been let out onto the streets and would be visible within minutes. When it is your first time running, you have no idea what to expect. Seeing it on television or the internet does not afford you the opportunity of feeling the adrenaline and anxiety in the air. Once you catch the first glimpse of the charging bulls, your instinct tells you to do exactly as everybody is doing – turn and run as fast as your legs will carry you! The bulls thunder past you to a cacophony of sounds: snorting, pounding of hooves, runners shouting, spectators cheering and whistling. Runners are fixated on moving forward and in so doing, they stampede toward and through bodies in front of them in much the same way as the bulls do. It seemed as if people were constantly getting knocked to the ground. I didn’t expect to have to jump over as many fallen bodies as I did. The custom of helping up a fallen runner does not really exist, since runners are warned to stay down if they fall as it could be deadly to try and stand up and thereby face a bull head-on. There is so much commotion and confusion, that in the midst of it all, it is quite impossible to know if the bulls have all passed. Once running, you continue to run forward and toward the bull ring, into which the bulls must enter. The bull ring at the end of the run was not something I was expecting either. I figured that it was something of a grand finale and that runners would turn around and exit the ring after all had entered. Once the runners had all made it into the ring, the exit/entrance was closed off so that nobody else can enter or leave. The ring was filled with hundreds of runners who had made it that far and the stadium stands were packed with thousands of cheering spectators. When you join the other runners, you almost feel like a gladiator from ancient times. This feeling was heightened after a few minutes of being hailed by the spectators. 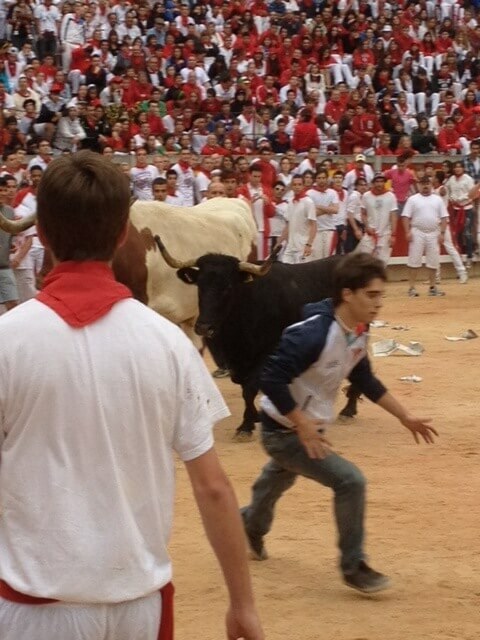 Without any word of warning, a bull was let loose into the ring with us. I did not realize at first why the others were running away from the opposite side of the ring, but as they scattered, the sight of the oncoming bull was self-explanatory! bull, a large cheer would go up from the stands. Fortunately, these were not the same bulls as the ones which had been running through the streets. The stadium bulls were younger and while very aggressive – not as ferocious or as deadly as the fully grown versions. After the bull had had his way with us for about ten minutes, a man would enter the ring, accompanied by a large cow. The cow’s job was to lure the young bull away from the action and out of the ring. Most of the young bulls responded fairly immediately to the cow’s presence and trotted off with her out of the ring. There were a few however, who continued to hunt for human prey, or who had become so engrossed with finding victims that they ignored the cow and the bull herder had to bring the cow to the bull and coax him out of the ring. 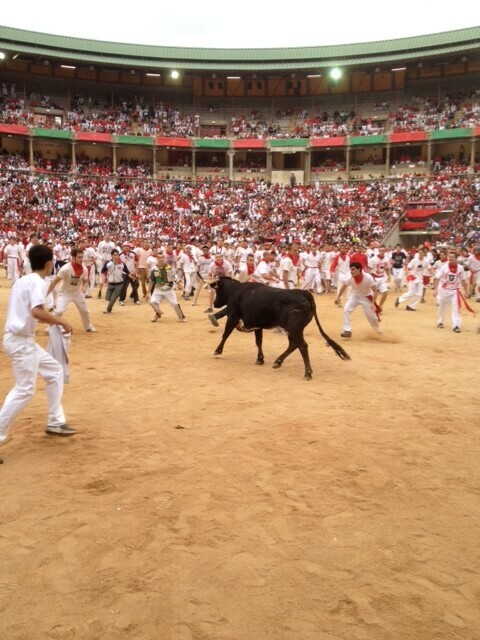 Runners dodge attacking bulls while inside the ring. Having survived the first day with the bulls, I decided that a second day was needed to see if the first day’s survivability was just a fluke. Thankfully, I also managed to survive the second day. My strategy for day 2 was to try and push the envelope a little further. After all, I was now a veteran and could afford to take more chances. The morning of the second day, I scoped out the streets once again. This time I decided to stay around Dead Man’s Corner as this was one of the more dangerous areas. With adrenaline pumping, I counted down the minutes until the beasts would turn the corner in full charge. I didn’t have to wait long. Once again, as soon as the bulls turned the corner, runners turned on their heels and scattered to the four winds. As they ran towards me, I too turned and bolted forward. Unfortunately, the runners closest to the bulls were so intent on making good their escape, that they moved en masse to their right and as a result, threw everyone who was already on the right side of the street into the shop fronts. About a dozen to eighteen people collapsed on the street causing a major road block of bodies. Fortunately, I was able to clear the fallen and join the pack moving forward. Not knowing how many bulls still remained behind me, I forged ahead and did not stop until I had entered the arena. This time I took close-up shots of the arena action! Now the question remains: was it a once-in-a-lifetime experience, or will it become an annual event? For more from John Sexton, read From Ireland Police Recruit to U.N. International Investigator to American EPS. John Sexton, CII, PPS, CST, is the President and Director of Training for the SEXTON Training Institute. He has over 30 years experience in law enforcement, non-governmental organizations such as the United Nations and various corporations. 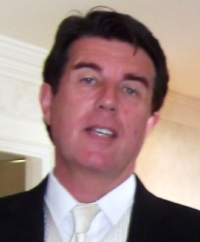 He has worked and traveled extensively throughout West and Eastern Europe, Africa, Asia and the Middle East. Prior to joining the United Nations in 1994 and working with the Government of Mozambique, he was a member of a counter-terrorist unit in the British Isles. His service in the former Yugoslavia as Chief of the Special Investigations Unit took him throughout Croatia, Serbia, Bosnia/Herzegovina and Macedonia during the Balkan wars of the mid 90’s. After five continuous years in the Balkans, he settled in the Washington D.C. Metro area in 2000, where he founded his own private security firm and training academy. He is registered as a P.I., Personal Protection Specialist, and holds a PPS Advanced Handgun from DCJS. He is an NRA firearms instructor and a Bureau of Criminal Identification Firearm Instructor. In addition he is certified as a general instructor by the Dept. of Criminal Justice Services and is an internationally trained instructor, certified by the Academy of Security Educators and Trainers and a former Board Member of A.S.E.T.